Judging by the emails I'm getting, hikers from all over the world are making their way to Spain to walk the GR1 with the help of my guide book Fingers crossed, I am of course totally confident will find their way, agree with me that this is an amazing walk and come back making plans for their next trip to Spain. The guide is based on my style of walking and involves going from place to place and staying in local accommodation. Historically, of course, the Spanish countryside was awash with locally run bars, restaurants, and hotels, but as the countryside emptied the purchasing power to support these facilities declined dramatically. Some of those that remain are hanging on by the skin of their teeth and hopefully the business provided by GR1 walkers will make a small but valuable contribution to their survival. Inevitably, however 'things change' and places close. More optimistically new places open up or more likely as more people walk the route additional places to stay are found, places that despite my best efforts I missed. It's amazing, but even in this day and age some 'hotels' in Spain keep their electronic footprint to the absolute minimum and exist despite not having email never mind a website. Although I check for openings and closures as often as I can the best source of information comes from people planning and walking the route and will be used to update this blog page. I'll also forward the information for Cicerone to include on their website. I'm particularly grateful for comments from Ed Hoekstra who walked the whole of the GR1 from east to west in 2017 and Peter Bastide who walked Stages 3 to 5 in October 2018. Getting to the start of the walk at the Puerto de Tarna is a challenge. Staying somewhere the night before on the Asturian side of the pass is the recommended approach. In addition to Rafael at Bezanes consider the Hotel Rurale Reciegos Agrotourismo at Campo de Caso which has its own website and can be booked on Booking.Com, or the Casa de Aldea Los Riegos at Balerda (which has a web site). In addition to the accommodation mentioned in the guide at Las Salas or Salamon consider the Centro de Tourismo Rural Vegalion which located to the south of Las Salas and can be found on Booking.Com. Unfortunately, the Hostal Las Pinta in Las Salas itself appears to be closed. Ed recommends the casa rural El Serrano where the owner provides breakfast the night before to enable an early getaway. Additional accommodation, a casa rural, the Carmargue, offering bed and breakfast has been spotted in San Martin de los Herros. The Casa Engaña gets a strong recommendation. As an alternative to the accommodation mentioned at Salazar consider the Ana Maria Casa Rural at Cigüenza - (699 054 101) or the Hotel Plati at Villarcayo, a small town which is closer to the route than Medina de Pomar - the town mentioned in the text. The web address for the hotel is www.hotelplati.es. This Stage finishes as at Paresotas and the recommended accommodation is down the road at Oteo. Unfortunately, the kindly landlord of the little hotel there, the Los Perrichos, who gave me a lift to and from the GR1 has died and his widow has decided to close it. An excellent alternative exists however in Quincoces de Yuso at the Hotel Restaurante Puente Romana. Juan Holgado, my Spanish walking buddy, has stayed there and Juanma, the owner is looking forward to greeting GR1 walkers. The hotel can be booked on booking.com or contacted directly on +34 947 19 40 89. Juanma if not busy might be persuaded to give you a lift, but otherwise ring Pascual on +34 670 665 836 who for about 8 euros will come and pick you up in his taxi. This year Ed found a footpath coming off the GR1 with waymarks to Quincoces de Yuso so he got there without taking the taxi. Not quite sure where this footpath is and Ed was walking from east to west so this might be an option for the return trip. Thanks to Greg for letting me know that there is a campsite just off the route at Villanañe. Villanañe is an interesting place to visit and like many Spanish campsites provides accommodation for non-campers in chalets - or as my wife calls them, garden sheds. Details can be found at www.camping.angosta.com . Accommodation wise, this is a challenging stretch of GR1. The good news is that Greg has added the Hotel Durtzi in Sobrón to the options described in the guide. Although still away of the route it is not as far Miranda de Ebro (7km versus 10km) and situated right in the middle of the spa town looks a pretty place. When you get to Fontecha stick your thumb out and you'll soon get a lift, otherwise just head west along the road. In Mirando de Ebro the La Taberna Grande and the Pension Matilla can now be added to the list of recommended hotels. 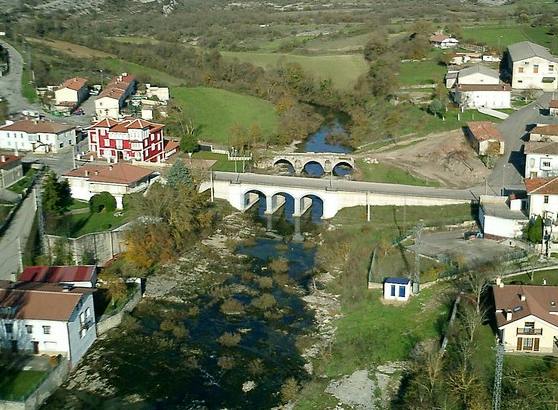 The restaurant mentioned in Armiñón, which is called the El Viso, is in the next village Estavillo, there is a sign to it in Armiñon. If the restaurants in the Peñacerrada are closed (they were in October 2018) Maitre at the mill will provide food. The web address for the mill is now www.escapadarural.com/casa-rural/alava/errota. Additional accommodation has been found in Santa Cruz de Campezo at the bar/restaurant next to the gas station - a good option as the recommendation in the guide is out of town. Peter reported that the restaurant at the gas station is shut on Mondays and that the Ibernalo, the recommended accommodation was shut in October. If you can't find accommodation at Santa Cruz de Campezo you might have to push onto the Santuario de Nuestra Señora de Codés. The Hotel Merindad de Olite 948 740 735 has several very positive reviews and can be added to the list of places to stay in Olite. Stephen had trouble finding accommodation at Ujue at the recommended El Chofer. My latest information is that the bed and breakfast there doesn't open until after Easter. There are Casa Rural alternatives and Ed has stayed at the Agro Villa in the centre of town +34 699 027403 and it was very good. There is now a new hotel has opened at Gallipienzo Antiguo. This is beautiful but semi-deserted village and staying there means that it's now possible for non-campers to stay on the route without having to walk 34km from Ujué to Sos del Rey Católico - it's a big improvement to this section of the GR1. The hotel has only recently opened and is called Heredad Berugu. It does not have a website but bookings can be made by ringing +34 948 050 109. Another recommendation for the Hostal las Coronas where unusally the chef does vegetarian options. Ed took the option described in the guide and split this long stage into two - he stayed in the Hostal Rural and the manager took them back to the route next day. A recent visitor heard that both the bar and the Hostal la Costera in Agüero had closed. In addition to the accommodation already listed for Murillo Gállego La Casona de la Reina Berta 628 096 262 now has a string of good reviews and the owner, who is a GR1 enthusiast, will help sort of accommodation problems further along the trail if needed. In October all the restaurants in the town were shut but the owner at the La Casona de la Reina Berta cooked Peter a meal. Ed found another casa rural in Loarre - the Casa Tolta - +34 974 382 605. When Peter arrived there none of the restaurants in the town did food in the evening, he went to the campsite about a mile about of town. If you can get there in time for lunch (before 4) you should get fed. Bolea - Albergue A Gargalé has closed down. There is an albergue for St James Way pilgrims. Theoretically, you need to carry a "credencial' to use it but staying there shouldn't be a problem if its not full. Peter stayed at the stayed at http://www.pirineodigital.com/rosadelosvientos/. The Hostal Migalón is called "Barbacana" - it's still wonderful. Peter found that from August it shuts on Saturdays but he found friendly accommodation 700m down the road at the Hotel Capricho de Arguis. Ed found another auberge on the route 2km beyond Nocito - the refuge-san urbez. It's worth stressing that staying here, and it's had some very positive reviews, makes the next day 2kms shorter. 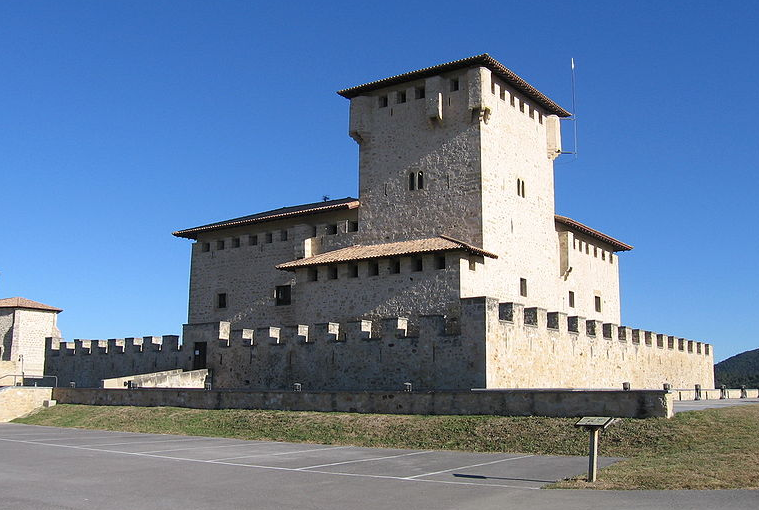 The number for the booking office at the Ligüerre de Cinca is 974 500 800 - when I went there I was able to book in at the hotel but more recent visitors who had not booked in advance were told that they had to go to the booking office which was 2 kms down the road. It has recently been confirmed that at the weekends the Ligüerre de Cinca is a wedding venue but accommodation in little bungalows (really large garden sheds) is available on the nearby campsite. Watch out though, food can be problem - the restaurant was closed when Ed arrived but reception made them some sandwiches. When Peter stayed there, the restuarant was also closed but they made him some food the day before and left it in the room for him to microwave up. The phone number and web address for the Casa Puyuelo listed in the guide is wrong and refers to another casa rural with the same name 20kms or so to the north. The correct Casa Puyuelo is however listed on booking.com at Tierrantona and is described. The development at Pano is still happening, Ed reports that you can stay there but not get any food. The telephone number for the Hostal Migalón at Arguis (the reviews continue to be very favourable) is now +39 974 272 062. Additional accommodation in Sant Pau de Segúries can be found at Habitacion Aurora at 972 747 100. Walking Section 1 and loving it (Peter and Kathy, mid-sixties, from California). Some accommodation updates for the start: We took the 2-hour bus from Oviedo to Soto and walked 5 minutes to Los Riegos, great casa rural, v knowledgeable zoologist couple. Beautiful hikes right out their door. 25 euro ride from there to Puerta de Tarna, hiking on the GR1 by 10:00. Note new hostel/bar in Maraña (west end of village, dormitory style) www.alberguedemarana.com . We wanted to shorten the first day so found a casa rural in Lois, La Catedral de la Montaña, on booking.com . Flexible with meal-times, may be closed off season unless you reserve ahead. We’re now relaxing at the Vegalion outside Las Salas, after a short 10 km second day. We’ll post further updates. Great stuff Peter - you've got some great walking to come, I'm very jealous. How is the weather? Bright blue skies, 20 + and sunny. Crisp mornings, beautiful fall color—thanks for laying it on, John! we´re on the trail this week, blessed with brilliant weather. We should have took your advice on the 7kg, our 30kg rucksacks are somewhat of a challenge so we are having an unexpected rest day. Thanks for that - seems like there are a few people making 'late hay' on the GR1 in October. It's windy and wet in the UK so I'm holed up working on my next guide. I would recommend some serious pruning on the ruck-sack front - drop the kitchen sink! Now in Cervera de Pisuerga at the Hostal Restaurante Peñalabra (end of Section 1, Stage 4). Excellent comida (holiday—restaurant packed and full of life). Very comfortable, modern hotel. Hotel rural Vegalion in Las Salsas very welcoming. Owned and operated by Russian couple. Willing to serve meals at any hour. Large cooked breakfast. Stage 3: Very minor re-routing on climb up to the Collado de Cruz Armada, somewhat abbreviating the switchbacks. Amazing, unseasonably warm, dry weather continues. In six days on the GR1, we have not encountered a single other overnight hiker! Fascinating conversations in the evenings about the Catalonian situation. Glad to hear you're still making progress. Please carry onto the Mediterranean. On the basis of your current discoveries I'll have a really rich description of all the new accommodation options. There is a group of three walking near you. Based on the comment above they have some heavy bags and may be moving slowly. It's must be an interesting time to be in Spain. I just hope they realise that what they have in common is so much better than the stuff they think makes them different. We rested in Cervera a day (end of Section 1, Stage 4), and strolled back to Ruesga for a great comida at the Bar Restaurante Juanon (excellent sirloin grilled on a hot stone at the table—carne a la piedra). Then an early start the next morning for the long but beautiful Stage 5 to Brañosera (we took the shortcut at the end). Stayed at the San Roque (good comida, adequate accommodation). At this point, as planned, we ended this year’s walk on the GR1, got a ride to Reinosa and several buses to Laguardia in La Rioja wine region. We’ll take a bus to Victoria-Gasteiz tomorrow, then four days of walking north on the GR38, to Bermeo on the Atlantic. Then a short bus ride to Bilbao to return home. Thank you for introducing us to this beautiful part of Spain! We hope to walk some more of the GR1 in the future. Best wishes for your current project. So pleased you enjoyed yourself and thank you so much for keeping me up to date on your travels. Let me know how much time you have when you next come back and I'll put together some suggestions. If you have time,by the way, Bilbao has some amazing restaurants. Great value 1 star Michelins. A favourite place for us. We went to two. Can't remember the name of the 2nd one but the first was the restaurant Mina. Very modern Spanish. 14 course taster with wine flight, we loved it. Many thanks, John! Mina looks great, but unfortunately closed when we’re in town. Now trying to get a reservation at Extanobe.